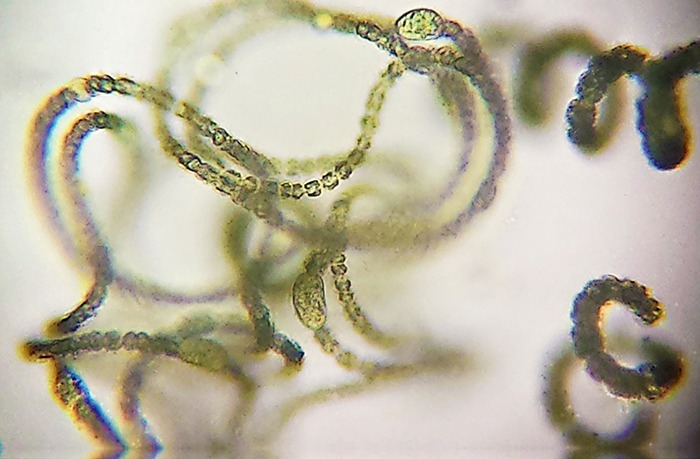 Nostoc is common in fresh ponds. The large colonies found free floating as small circular balls. It may be attached to the submerged plants. Nostoc can be found in soils on moist rocks, at the bottom of lakes and springs (both fresh- and saltwater), and rarely in marine habitats. It may also grow symbiotically within the tissues of plants such as hornworts, providing nitrogen to its host through the action of terminally differentiated cells known as heterocysts. It may found as algal component of certain lichens. Many twisted trichomes aggregate in a gelatinous matrix to form a bail-like globular or ellipsoidal colony which ranges from greenish to bluish-green in color. The colony is externally bounded by a tough, firm and pellicle-like membrane which provides a definite shape to the colony. The cell is typical prokaryotic type. The cells are without any mitochondria, endoplasmic reticulum and Golgi bodies. Plastids are absent. The pigments are found in the cytoplasm called as chromatoplasm. Cells are blue in color due to the presence of phycocyanine (a blue pigment), chlorophyll, carotene and phycoerythrnin. A definite nucleus is absent and nuclear material is present as central body which lacks nucleolus. Reserve food is in the form of sugars and glycogens and proteinaceous material cyanophycin. The usual methods of reproduction in Nostoc are vegetative and asexual reproduction. The sexual reproduction by union of gametes is absent. The reproduction usually takes place by the following methods in the Nostoc. The colony breaks dawn into two or more fragments accidently or due to some physiological reason. Each fragment growes into a new colony. The akinetes which are resting spores are called as arthrospores. In some species, e g. Nostoc microscopium and N. commune, heterocyst contents divide to produce endospores. These spores are released and develop into new filaments.